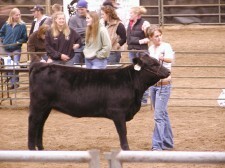 Several different types of equipment are needed for working with show cattle. The equipment needed varies with the situation – whether it’s at home or the cows show. In this section, cattle showing equipment needed at home will be discussed. Proper tools for whatever job is at hand always make the job easier to complete. Show cattle work is certainly no exception to that rule. Facilities are the first consideration in equipment. Cattle need shelter from extremes in weather. During the summer, shade is needed from the sun. Cooling equipment like a large barn fan is helpful to keep cattle cool and happy during the summer. Some cattle exhibitors even have device that blow mist in front of the fan output to help cool the cattle. One technique that will help beef cattle excel in shows is having a great deal of hair. It is hard for cattle to grow hair in the summer, especially if they are hot and in the sun. Facilities should include a training pen. In this training pen, cattle exhibitors will train their cattle to walk and “set up” properly. Just like growing hair, proper training through lots of repetition will help cattle excel in cows show competition. Next, feed and water are important. Older show cattle need at least 20 gallons of water daily. A good rule of thumb is that exhibitors should have water that is so fresh and clean available that they would drink it themselves. A sturdy feed trough is needed also. It should be able to withstand the abuse that a 1,000 pound calf can dish out. Also, it should be accessible so it can be cleaned out as needed. In fact, some cattle refuse to eat old feed, so, it is necessary to clean out the troughs for some cattle several times daily.